Fans in Phoenix got to see an extra segment after NXT TakeOver went off the air. As Johnny Gargano and Tommaso Ciampa celebrated on stage, they were interrupted by none other than Velveteen Dream. Adam Cole then came out as well, but a brawl was started when Aleister Black and Ricochet came on board. 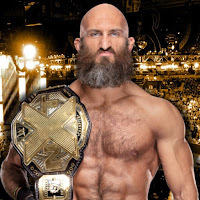 All six men brawled backstage until it was broken up by Triple H.
After the ruckus ended, the three faces came out and posed for the crowd (which led to fan speculation that they could be gone from NXT sooner rather than later).